Hotel ibis Duisburg Hauptbahnhof. Book online now! Wifi! 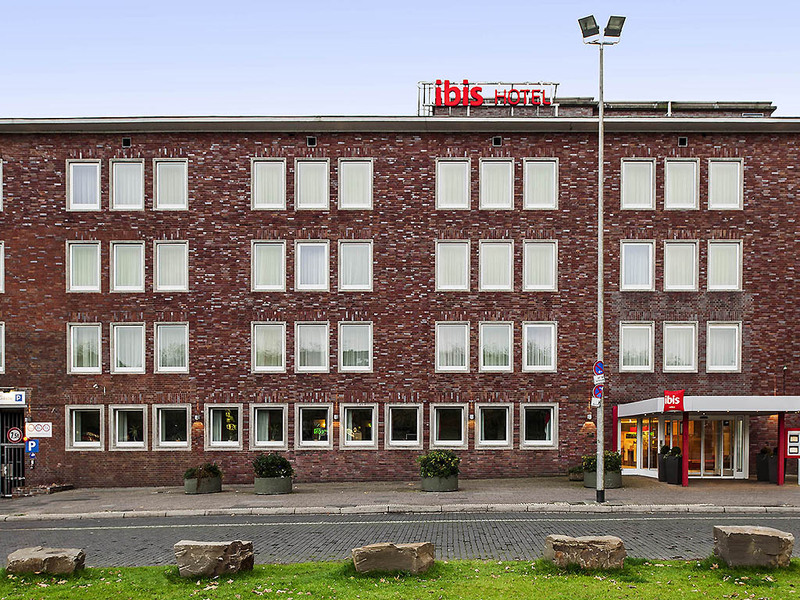 Just a stone's throw away from the city center: the ibis Duisburg is ideally located for all activities. Holiday makers will be delighted by the inner harbor, casino and landscaped gardens. Business travelers will benefit from the favorable conditions for professional meetings, thanks to the nearby exhibition cities of Düsseldorf and Essen, a varied selection of meeting rooms and a bar that is open around the clock. The 95 rooms have modern furnishings, WIFI, air conditioning and a desk. Make the most of sunny days on our bar terrace where you can sit in the fresh air with your favorite drink or a snack. Soak up the sun and relax! All 95 rooms feature wonderfully comfortable Sweet Bed by ibis beds for a good night's sleep. Amenities include air conditioning, free WIFI, TV with a wide range of Sky channels, and a desk for your office on the go. The hotel is next to the station, which means it is very convenient for anyone who has business around Duisburg or in Düsseldorf. Like all Ibis hotels, it is clean and comfortable and provides a good breakfast and light meals at the bar. It was standard week at hotel, with no special events. I am often staying at this hotel. I am recognised as well known client - that is nice. I stay at the same room I like. Always I get the welcome drink - that is also nice. I do not have special requirements, as I am in business trip. I am not sure if Ibis hotel can be equipped with a kettle just to make a tea in the evening. Maybe it is possible, it will be a little wish. At first I want to say that I usually like to stay at Ibis but this stay wasn’t good at all. Very small, old and uncomfortable room. Furthermore it was dirty (hair in the bathroom and in the bed). No eggs for breakfast available anymore at 08:00am. I definitely won’t book this hotel again. I’m sorry. Regards, Janis H.
Good hotel, nice big rooms, perfect location, unfortunately no early breakfast available. As to be expected service and standards. Nothing I wasn't expecting and everything that I was. I arrived, with speed checked in and got to my room. From day one until checkout, I had been grateful for the excellent service and assistance. Please keep it up ! Thank you ! The happy face of the front desk staff had welcomed me, took little time to hand me the room key. His sense of humor and yet professionalism has taken my fatigues away. He doesn’t need a crystal ball to see and to understand my additional requests. However, the morning female front desk staff should learn and be trained like he is . Nice place to stay, near to the Train stations. Breakfast is very good. Friendly staff especially the reception staff. Very cooperative and have full information about the area can guide the guest. Hotel is very convenient, right next door to main station. Check-in was fast. Room was larger and more modern than some other ibis hotels I have stayed in. No problems at all. Good hotel and friendly staff. I only had one little complaint: When booking my flexible reservation, the ibis Web site requested a credit card to be logged as security. When we arrived at the hotel, the reception staff said: &quot;We've already taken the payment from your credit card, you only need to sign here.&quot; After a long drive on the motorway, I was just too tired to argue, but I realised afterwards that I should have: It was not my intention to pay with this credit card, because it is run on GBP and any payment made in Germany has to be converted into EUR, incurring extra fees. Instead, I had enough EUR cash with me to pay and would have preferred that. I do understand that ibis wanted some security on my booking, but this is different from actually using the payment method without asking for my consent. the big problem is that the air conditioning was not working when I stayed there for 2 nights. and there was a heat wave at that time and my room faced west. at first I was told that there was a defect with the thermostat in my room and did I want to change rooms. this was after I had already opened up my luggage and gotten settled in, so I was not interested in changing rooms then. then the morning I checked out, I tried one more time to make the thermostat work and it worked. this was a Monday morning I was checking out. so I talked to the front desk staff and they told me that the hotel was unprepared for the heat wave the days before and that they had already switched to the heating mode. this is really unacceptable, especially to be told different stories. the breakfast buffet was good. i liked the 24 hr. bar (used it late at night) and the location is great being next to the train station. Ok, but broken bedside table and not very clean. Breakfast slightly better than last time.